In Fulcrum, the Apps refer to dynamic and customizable groups of attributes composed of different data types - text, numbers, dates, picklists, photos, settings, and more. Basically, an App is the form used on the mobile device to fill out record attributes along with all the other rules and settings you configure. They also act as databases to hold your collected data. Apps are always created on the Fulcrum web app, as the mobile device is only used for collecting data. There are two ways to create an app: choosing a template or creating from scratch. First we will cover how to select an app template and then we will create a simple app that can be used to capture ATM information. Fulcrum has a number of app templates that can be used to collect data if it meets your needs, or just as a way to get some ideas. Every template can be modified. Many of the templates have pre-made choice lists and custom classification sets. You can now browse through the categories or use the search box for a specific app. For this tutorial, let’s add the “Handicapped Accessibility” app from the Health Apps category. Inside the Health Apps category, select "App Details" on the Handicapped Accessibility. Then select "Add This App to (your plan name)." The app will automatically be imported into your account. After you have added the handicapped template, return to the app gallery. 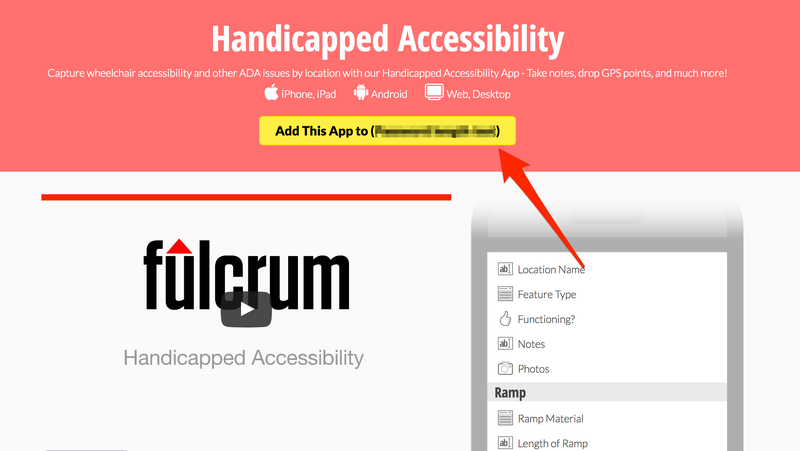 You can do this by clicking “go back” or by clicking on the Fulcrum logo on the top left side of the screen. You will now notice that the new app on the main dashboard page. Creating an app from scratch leads you to the app designer. Click ‘+ New App’ from the menu bar. This will bring you to the app designer, or app builder. 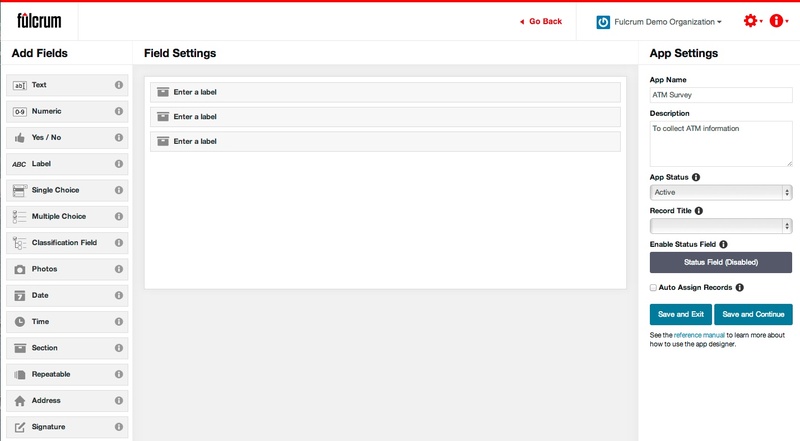 This feature consists of a list of drag and drop fields on the left, and an app settings menu on the right. The app palette area in the middle is where the app will be created. Read more about each field in the reference pages. Let’s fill out the app settings menu. For this tutorial, we will be making a general ATM survey app. Name the app “ATM Survey” and enter a brief description. We will keep the app status as “active” which means it will be visible on the mobile device. 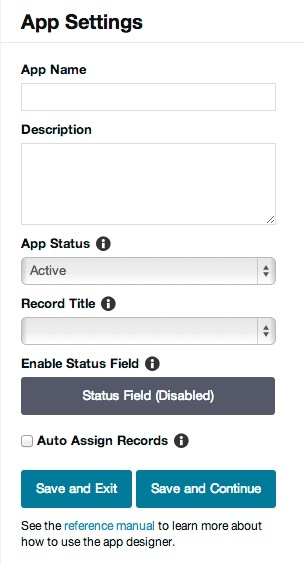 Skip the “record title.” This will automatically be filled out as you add fields to the app. The status field and auto assign records features are not covered in this tutorial. To learn more about these features please visit the status field and record assignment pages of the manual. We will begin by adding three section fields to the app and then title these sections. 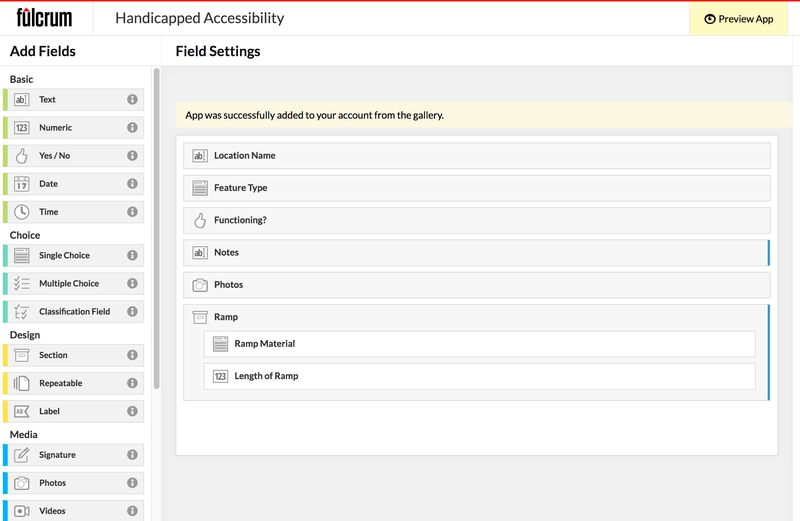 Sections field types allow you to modify the layout of your app and can help with the app flow by allowing you to logically group fields together. This can help with adding more advanced features such as using conditional logic. Start the app by dragging three section fields to the palette area. Be careful not to nest a section inside one of the other sections. Click where it says ‘enter a label’ to bring up the field settings box. Name the first section “Basic Information”, the second “ATM Functions”, and the third “Conditions”. You may have noticed the display options for the section fields. This allows you to change how the section will be presented on the mobile device. Go ahead and select drill down for the conditions section. Now we will add fields to the ‘Basic Information’ section of the app. This section will capture the general information of the app such as the operator of the ATM and information about the fees that this ATM charges. Drag a text field into the section. To do this drag the text field more towards the center to the app designer’s pallet area. Then click “enter a label” on the text field to bring up the field settings pop out. Type “Operator” into the label box. Below is an image of how your app should look so far. In the rare chance, you find an ATM that does not charge any fees. You will want to make it so the “Fee amount” Field only shows when “yes” is selected on the “fee” yes/no field. To do this, we will use conditional logic. Start by click on the “Fee amount” field to bring up the field settings. Then click Visibility Rules at the bottom of the settings screen. We do not have to worry about the match rules since this field is only going to contain one rule. Setting this setting to either ALL or ANY will work. In the -Select a form element- select the “fee” field. Since we only what this field to show when the “fee” field is equal to yes we can leave the equal to in place. Your visibility logic should look like the photo below and if it does click the save button. Now we that we have completed the first section. We can add the fields to next section. 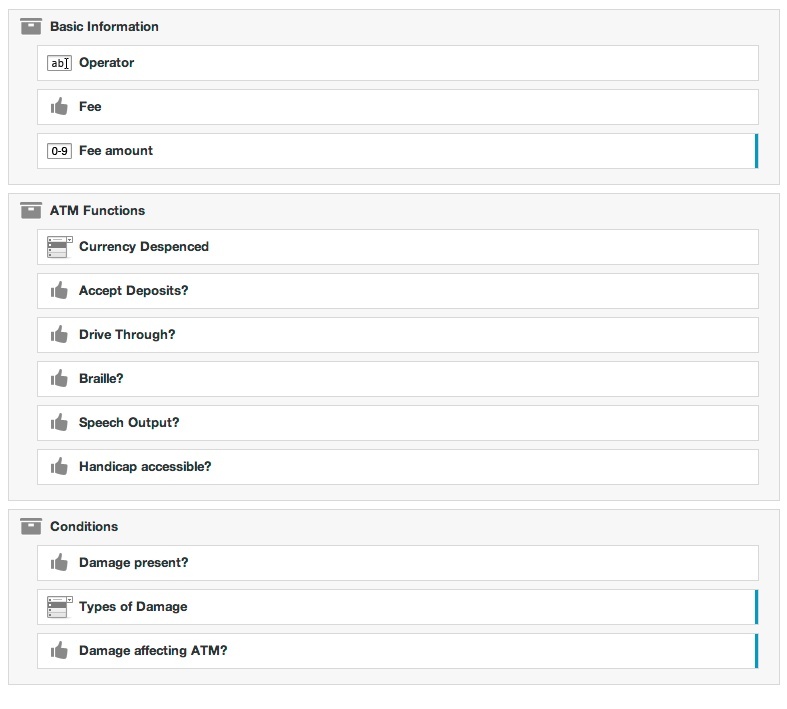 In the ATM functions section, we will add information about the what features the ATMs offer. Now on to the next section. In the “ATM Functions” section, drag in a single choice field. The single choice field will be used to collect data about the currency that the ATM dispenses. 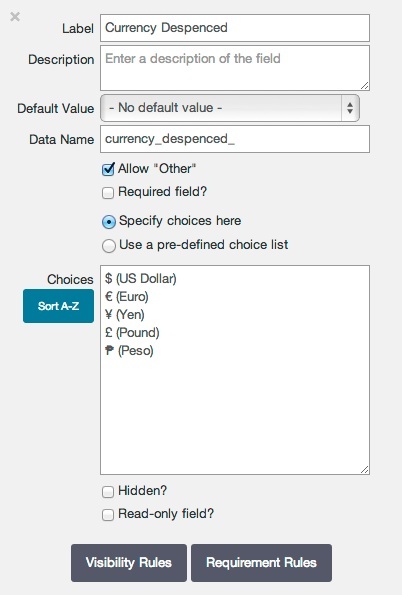 So label the field “Currency Dispensed.” Towards the bottom of the field settings, you will want to add the choices that are presented when collecting data. Since we will not be listing every currency available you will want to check the “allow other” check box. Below is an example of what your choice list could look like. Now we will add five additional yes/no fields to the “ATM Functions” sections. Match the labels up to the labels in the image below. Now we will be adding fields to the “conditions” section. This section captures information about the general condition of the ATM. In the last section, we want to add information about the condition of the ATM. We will use a yes/no field to see if there is damage or not and then using visibility logic display two additional field, a Multiple Choice field, and a yes/no field. Use the information that you previously learned to complete these three fields, with choice values, and visibility logic. Your end result should look like the image below.